Personal Items: Personal items can be no larger than 14” tall, 18” wide, and 8” long. Personal items must fit under the seat in front of you. Think purses, totes, computer bags, briefcases, diaper bags and kids backpacks! Carry-On Baggage: Carry-On Bags can be no larger than 24” tall, 10” wide, and 16” long (including handles, wheels, and straps) and no heavier than 35 pounds. Carry-on Bags must be able to fit either underneath the seat or in the overhead bin. Think large backpacks, small duffel bags and small suitcases/wheeled bags! Checked Baggage: Checked bags must be no larger than 62 linear inches (that’s length + width + depth) and no heavier than 50 pounds. Baggage that exceeds these limits will have an additional charge of $75 for each bag that is overweight and $75 for each oversized bag, and bags over 100 pounds or in excess of 110 linear inches will not be accepted. Think large duffel bags, large suitcases and sporting equipment! Don't forget to purchase your bag ahead of time - Prices are higher at the airport! 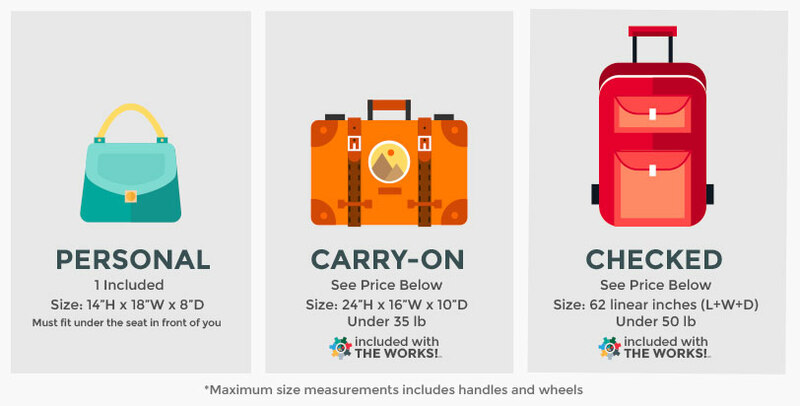 If you purchased one of our Bundles, the WORKS℠ or the PERKS℠, a carry-on and checked bag is included! For more information on baggage, visit our Baggage page.